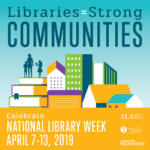 In celebration of National Library Week, you’re invited to attend Towanda District Library’s Open House this Thursday, April 11 from 2:30 – 5:30 pm. Refreshments will be provided, and all visitors will have the opportunity to win a variety of raffle prizes–including a stylish book bag with a $25 Barnes & Noble gift card! Participate in a quick library scavenger hunt to discover new and improved features of our library (…and to earn additional raffle tickets!) We are excited to celebrate 30 years of serving our community, and we look forward to seeing you.